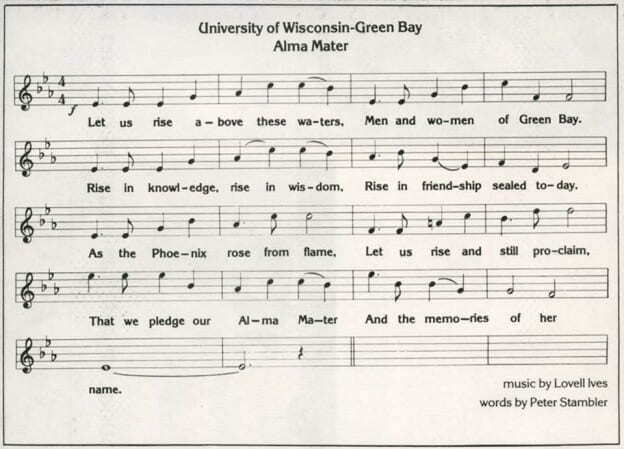 Lovell Ives of the Music faculty arranged a hymn-like melody — simple to sing and dignified — in the fall of 1980 for the official UWGB alma mater. Poet Peter Stambler of the Humanistic Studies faculty provided the words, alluding to the mythical Phoenix bird, the UWGB mascot. The alma mater was introduced at May 1981 commencement in a solo performance by choral Prof. Trinidad Chavez. This entry was posted in Phoenix Phactoid and tagged alumni, facts, music, trivia on August 4, 2015 by Christopher Sampson. In 2005, a core group of UW-Green Bay alumni had to sort through sweet corn memories and bittersweet emotions following announcement that Bayfest 2005 would be the last. “The festival, and especially the corn tent, hold a lot of wonderful memories,” said Pam Stoll ’74 (at far left), former alumni president and longtime volunteer. “Working in the tent was the first thing I did as a returning alumnus.” Bayfest, held on the grounds of the University and featuring music, food and games, had a 25-year run under the direction of the late Tim Quigley as a primary fundraiser (an estimated $2.5 million total) for UWGB’s Division I athletics program. 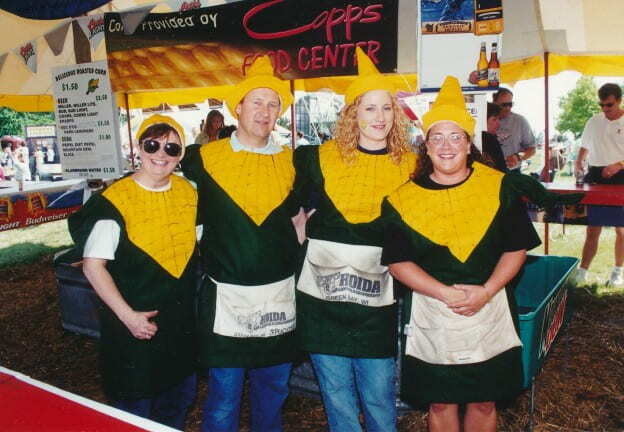 The UW-Green Bay Alumni Association staffed the corn tent for 13 years, selling close to 5,000 ears of corn annually to benefit student scholarships and alumni special events. This entry was posted in Phoenix Phactoid and tagged alumni, bayfest, facts, trivia on August 1, 2015 by Christopher Sampson. Corn maze. Fighting tomatoes. Sailing club. Blue shag covered elevator walls. Opening of the Kress Sports Center. Shorewood Club. Liberal Education Seminars. Eco U. Living in the Trads. 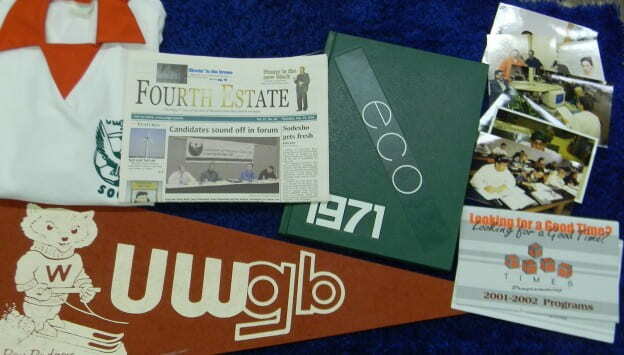 Can you tell we are deeply immersed in projects to celebrate the 50th anniversary of UWGB? Here is a glimpse of a few items we are gathering. What would you like to see highlighted as part of UWGB’s history? Send us your memories and stories. We would love to hear from UWGB Alums, staff, and current students. This content was originally posted by the UW-Green Bay Archives and Area Research Center to their facebook page on Thursday, June 11, 2015. View the original Facebook post. This entry was posted in Throwback Thursdays and tagged alumni, college life on June 11, 2015 by Kimberly Vlies. In observance of UW-Green Bay’s 50th year, the Alumni Relations Office is collecting stories of transformation with the goal of sharing 50 alumni-submitted stories in the special 50th Anniversary celebration edition of Inside Magazine. Alumni are asked to share how their time at UWGB transformed their lives. Submissions may also be found in the “Shared Stories” section of the 50th Anniversary site. This entry was posted in 50th Anniversary News and tagged alumni on March 18, 2015 by Kimberly Vlies.